The New York Jets had won the 1968 AFL Championship and stunned the Baltimore Colts in Super Bowl III and were 4-2 as they hosted the Boston Patriots on October 26, 1969. Coached for the seventh year by Weeb Ewbank, the Jets were known primarily for their passing offense, and that centered around star QB Joe Namath and the outstanding wide receivers Don Maynard and George Sauer. With HB Emerson Boozer and FB Matt Snell (pictured above), they could run the ball, too. On defense they were sound on the line and at linebacker, but there were concerns about the defensive backfield. Boston was 0-6 and had already lost to the Jets at home. Their first-year head coach was Clive Rush, a former New York assistant, and another ex-Jet was the starting quarterback, Mike Taliaferro. There were promising young players such as HB Carl Garrett and G Mike Montler, but the defense was missing star MLB Nick Buoniconti, dealt away to Miami. However, the strong suit was the defensive backfield, and the Patriots hoped to disrupt New York’s passing attack. It was a sunny and pleasant day at Shea Stadium with 62,298 fans in attendance. The Patriots had the first possession and drove 82 yards in seven plays. 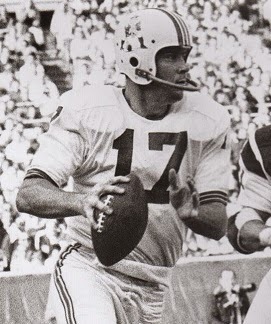 QB Mike Taliaferro had completions of 16 yards to WR Charley Frazier and 19 yards to Carl Garrett and connected with WR Bill Rademacher, yet another ex-Jet, in the end zone for a 22-yard touchdown. Gino Cappelletti added the extra point. New York put together a scoring drive in response. Joe Namath had a completion to George Sauer, but it was Matt Snell and Emerson Boozer carrying the load and Snell ran 12 yards for a TD. Jim Turner’s extra point tied the score at 7-7. Boston came right back with a 74-yard series. FB Jim Nance had a 16-yard run up the middle and, on a third-and-nine play, Taliaferro threw to Rademacher for 17 yards to the New York 40. The series finally ended with a Cappelletti field goal from 39 yards and the visitors took a 10-7 lead into the second quarter. The Jets continued to keep the ball on the ground, although Namath did find Don Maynard open for a 20-yard gain at one point. The drive stalled at the Boston 30 and Turner once again knotted the score with a 38-yard field goal. The Patriots had to punt following their next series, but made a big play on defense when safety John Charles intercepted a Namath pass and returned it 25 yards for a touchdown. Cappelletti converted and the visitors were again in the lead by 17-10. A short series by the Jets that ended in a punt led to Taliaferro being intercepted by CB Randy Beverly, who returned it to the Boston 33. However, Snell fumbled the ball back two plays later. The Patriots were forced to punt and New York advanced into Boston territory, but with time running out in the first half, Turner missed a 37-yard field goal attempt and the score remained unchanged at halftime. On the third play following the second half kickoff, the visitors got a break when Boozer fumbled and DT Ray Jacobs recovered for the Patriots. The turnover led to a field goal try by Cappelletti, but he was unsuccessful from 49 yards. The Jets reached midfield on their next possession, helped along by a Namath pass to Sauer that picked up 25 yards, but had to punt. However, they pinned the Patriots deep in their territory and, when forced to punt in turn, Janik’s kick traveled only 29 yards to give the Jets good field position at the Boston 41. In a series in which Snell ran four times for 16 yards, the Jets put points on the board with a 32-yard Turner field goal that narrowed Boston’s lead to 17-13. The Patriots again had to punt and, in a possession that extended into the fourth quarter, the Jets drove to another score. On a third-and-ten play, Namath, finding his receivers covered, uncharacteristically scrambled for 16 yards and New York picked up another 15 yards on a personal foul by the Patriots. Now at the Boston 47, the Jets pounded down the field and Boozer scored a touchdown from two yards out. Turner added the extra point and New York was ahead by 20-17. On the next series, Taliaferro fumbled when hit attempting to pass and DT John Elliott recovered at the Boston 31. The Jets kept the ball on the ground with Snell and Boozer carrying and added to the lead when Turner kicked a 13-yard field goal. With time winding down, the Patriots went three-and-out on their next series and punted. New York was able to run out the last two minutes and won by a final score of 23-17. The Jets had more total yards (318 to 211), with only 108 through the air but 210 on the ground, and also had the lead in first downs (21 to 10). New York was hurt by three turnovers, to two by the Patriots, but of the seven penalties called during the game, six were on Boston. Matt Snell rushed for 109 yards on 23 carries and Emerson Boozer contributed 67 yards on 15 attempts, with each scoring a touchdown. Joe Namath completed 10 of 21 passes for 115 yards and no touchdowns while giving up one interception. George Sauer had four catches for 58 yards to top the Jets. For the Patriots, Mike Taliaferro (pictured below) was successful on 12 of 24 throws for 139 yards and a TD with one interception. Jim Nance rushed for 58 yards on 11 carries and Carl Garrett added 20 on 8 attempts and also had four pass receptions for 40 yards. Bill Rademacher was the top receiver with 6 catches for 78 yards and a TD. The Jets cruised to first place in the Eastern Division with a 10-4 record but, in the expanded playoff format used in the AFL’s last year before merging with the NFL, they lost in the Divisional round to the Chiefs, second-place finishers in the Western Division. Boston won for the first time the following week against the Oilers, the first of four wins in five games, and ended up tied for third in the division with Buffalo at 4-10. The combination of Matt Snell and Emerson Boozer continued to be productive over the course of the season. Snell rushed for 695 yards on 191 carries (3.6 avg.) and was a consensus first-team All-AFL selection as well as AFL All-Star. Boozer had 604 yards on 130 attempts (4.6 avg.) and gained more yardage as a receiver (222 on 20 receptions to 187 on 22 catches for Snell). Mike Taliaferro had his most productive pro season, throwing for 2160 yards and 19 touchdowns, which tied Namath for second in the league. He was also named to the AFL All-Star game. Bill Rademacher’s performance against the Jets was the best of his career. A backup who caught just three passes during five years with New York, he had 17 receptions for 217 yards (12.8 avg.) and three TDs in ’69.